Transferred in 1989 from the School of Engineering and Applied Science (accession number 89:80). The collection contains two series: Sperry Rand Corporation, John P. Eckert, Jr., and John W. Mauchly vs. Bell Telephone, Incorporated; and two, Honeywell, Incorporated vs. Sperry Rand Corporation and Illinois Scientific Developments, Incorporated. Both series are arranged alphabetically by type of court document. There are two epochs in the history of computing: before the completion of the ENIAC (Electronic Numerical Integrator and Computer), and after. While there are several controversies about the development of the ENIAC and its immediate successors, there is nearly universal agreement on three points: the ENIAC was the watershed project which convinced the world that electronic computing was not merely possible, but practicable; it was a masterpiece of electrical engineering, unprecedented in reliability and computing speed; the two men most responsible for its conceptual and technical success were John Presper Eckert, Jr., and John William Mauchly, both of the Moore School of Electrical Engineering. The history of computing prior to the ENIAC was long and varied. The desire for a mechanical means of computation was ancient, and had prompted the invention of many devices from the abacus to the adding machine. These developments culminated in the work of Charles Babbage, whose grandiose, fully mechanical designs had largely been forgotten by the turn of the 20th century, and of Herman Hollerith, whose punched-card tabulators came to the rescue of the1880 Federal Census. The one feature common to all these early inventions was that the structure was basically mechanical in nature. By the second decade of the twentieth century work was done on finding electro-mechanical computing devices to substitute the slower and inefficient machines. These efforts were undertaken by the Massachusetts Institute of Technology through the initiative of the electrical manufacturers and power companies who needed better equipment to monitor their large and expanding electrical systems. The result of this work was the creation of the differential or Bush analyzer. Though the Bush analyzer was able to perform many mathematical equations, it was still at its core a mechanical device with an electric drive and thus could produce the greater precision and accuracy desired by scientists. It was partially in response to this retardation in the advancement of electrical engineering technology that the ENIAC was developed. The catalyst which advanced electrical engineering and the computer beyond the differential analyzer and to the ENIAC was the demands of the army during the 1930’s and particularly the Second World War. The practical need which the differential analyzer could not solve effectively was the preparation of firing tables–charts which showed how to aim artillery accurately. Too many people and too much time was required to prepare these tables. The federal government was willing to fund research undertaken to improve upon the existing technology. Recognizing this opportunity to expand research and acquire new computing devices, the Moore School of Electrical Engineering of the University of Pennsylvania sought and obtained a contract to develop a differential analyzer of its own. The inadequacies of these mechanical devises at the Moore School were soon recognized by John W. Mauchly, a physics professor, and J. Presper Eckert, a graduate student. Both men believed the best way to improve computer devices was to make these machines primarily electronic rather than mechanical. Despite skepticism from his colleagues in the field, Mauchly thought that vacuum tubes could be used to accelerate calculations and to increase accuracy. Eckert also believed that not only could vacuum tubes be used but also that the existing tubes could be utilized if operated at low voltages. Sometime after Mauchly discussed their ideas with other faculty members and wrote a memo. In 1942 the liaison between the Army Ordnance and the Moore School, Lt. Herman H. Goldstine, heard of Mauchly’s ideals for an electronic computer. Goldstine who was well acquainted with the shortcomings of the differential analyzer, was greatly interested in this project and suggested that a proposal to the army be written to develop an electronic computer. The Moore School officials took his advice and wrote a proposal. Finally, on April 9th, 1943 the Army granted a contract to the Moore School to build a large general-purpose electronic computer. 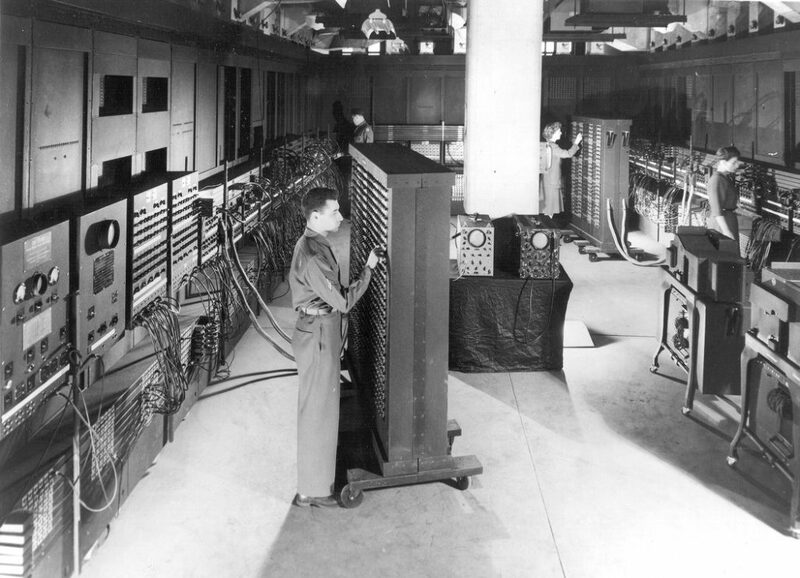 By end of 1945 the electronic computer developed at the Moore School, known as the ENIAC was operational. The significance of the ENIAC was soon understood by the many participants in its development who would later vie for recognition and control over the project. The first issue to cause problems later on was a paper written in June 1945 by John von Neuman, a mathematician who participated in discussions over the design of the ENIAC. In his paper von Neuman summarized the work of the project without giving any credit to Eckert or Mauchly; thus, presenting to those people in the profession who read the paper that von Neuman was responsible for the project. Another issue which created contention was patent rights and control over the project. During an attempt by Irven Travis to restructure the accounting operations and procedures of the Moore School in 1946, the Dean, Harold Presper, wrote a letter to Eckert and Mauchly in which he required them to sign a patent release form for all work they have done at the University and to place the interests of the University first rather than their own commercial interests in their work. Because they could not agree to such terms Eckert and Mauchly resigned from the Moore School staff in March of 1946. Though they had left the University and formed their own company, known as the Electronic Control Company, they still encountered problems over the ENIAC. In 1947 when they began to look into the possibility of taking out a patent on the ENIAC, Army lawyers informed them that the circulation of von Neuman’s paper among people in the profession made the ideals from the ENIAC part of the public domain. Eckert and Mauchly, however, were able file a patent on the ENIAC in June of 1947. Armed with the patent to the ENIAC and freed from the constraints of the University, they hoped to succeed in forming a successful computer company; their attempts at this, however, failed when they were unable to maintain a dedicated funding source to cover the varied expenses. Eventually in February of 1950, Eckert and Mauchly were forced to sell their company, by then known as the Eckert-Mauchly Computer Corporation, and the patent rights to the ENIAC to Remington Rand Corporation. Though the ENIAC patent was owned by a large corporation, problems over the validity and rights to the invention continued. While trying to secure the patent for the ENIAC, serious problems for the patent rights of Eckert and Mauchly, represented by Sperry Rand Corporation, arose in the 1960’s. Sperry Rand was engaged, in the early 1960’s, in litigation with Honeywell, Inc., and other companies, over the infringements of computer patents owned by Sperry Rand. By 1964 Sperry Rand was able to secure a stronger position on their claims to the electronic computer by being granted the ENIAC patent filed in 1947. Because of their former difficulties with Sperry Rand in the early 1960’s and anticipated difficulties from a possible suit to collect royalties, Honeywell filed a suit against Sperry Rand in 1967 on the grounds of anti-trust violations and unjustified claims to the electronic computer. The case was heard in the 4th Division of the Minnesota District Court (No. 4-67-Civ. 138). During the course of the trial two major points rose which tested the rights of Eckert and Mauchly to the ENIAC patent. The first point was over where the basic ideals used in the ENIAC’s design originated. Sperry Rand contented that the ENIAC was solely the invention of Eckert and Mauchly; however, Honeywell stated that Eckert and Mauchly had taken the idea from John Vincent Atanasoff and his assistant Clifford Berry. Building upon the basic historical view that all inventions are the result of the work of many people over time, Honeywell capitalized upon a visit Mauchly made in 1941 to Atanasoff. During this visit Atanasoff showed Mauchly a small electronic computer he had developed a few years before. Because there were some similarities in the design and operation of Atanasoff’s machine with the ENIAC, Honeywell asserted that Eckert and Mauchly used Atanasoff’s ideas for their own machine. The second major point concerned the filing of the patent in 1947. Because von Neuman had written a paper about the design of the ENIAC and circulated it a year before the patent application was filed, it was argued that the ENIAC had become part of the public domain and could not be patented. The U.S. District Court Judge in this case, Earl Richard Larson, determined that the ENIAC patent was invalid mainly because of the two points raised during the trial. He concluded that while Eckert and Mauchly may have created the ENIAC, they did not create the basic ideas used in the assembly of their computer. The ENIAC Papers are divided into two major series, viz., one, Sperry Rand Corporation, John P. Eckert, Jr., and John W. Mauchly vs. Bell Telephone, Incorporated; and two, Honeywell, Incorporated vs. Sperry Rand Corporation and Illinois Scientific Developments, Incorporated. The first series consists of only 2 cu. ft. and is primarily composed of exhibits used the case. A letter which was found in the series and is located in the first file indicates that these papers were sent to John Grist Brainerd, the head of the Moore School, in 1970 to assist him in his testimony for the Honeywell vs. Sperry Rand case. The papers are arranged by a code system which may have related to the original court filing. Unfortunately, a key to these codes was not found among the papers. The second and largest group of material (92 cu. ft.) in the ENIAC papers is the case file for Honeywell vs. Sperry Rand. The series is grouped into several different categories, as follows: boxes 1-3, lists, guides, and trial briefs for both the plaintiffs and defendants; boxes 3-11, the transcripts of the trial; boxes 12-16, depositions; boxes 16-59, the plaintiff’s trial exhibits; boxes 60-91, the defendant’s trial exhibits. The lists and guides are very useful in locating material in the rest of the series. For example, the copies of transcript index cards list, in order of exhibit number, all the exhibits introduced as evidence in the trial and cross reference them to the transcript. The most historically significant material is the depositions and trial exhibits. Both groups provide important information on the development of the ENIAC. One must bear in mind that only that information which would assistant each litigants’ claims was presented to the court. The exhibits contain a large collection of correspondence in addition to printed material relating to the development of the electronic computer. Almost all of the collection are photocopies of original documents. The notable exceptions are four original technical notebooks from the Mauchly Co. in the defendant’s trial exhibits, being numbers 3844, 4194, 4234, 4284. Despite the large volume of material contained in this series, the files are not complete. There are numerous gaps throughout the collection which require one to check other repositories. There are several places where one can find other copies and fuller copies of this collections material. At Hagley Museum and Library in Greenville, Delaware are the Sperry-UNIVAC Company Records, 1938-1970, which include the records of the Eckert-Mauchly Computer Corporation as well as the court papers for Honeywell vs. Sperry Rand and Sperry Rand vs. Bell Telephone -see Michael Nash Computer, Automation, and Cybernetics at the Hagley Museum and Library (Wilmington, Delaware: Hagley Museum and Library, 1989). The Charles Babbage Institute, University of Minnesota, Minneapolis, also has a collection of the Honeywell vs. Sperry Rand records in addition to the papers of Earl Richard Larson, the District Court judge. At Dartmouth College, New Hampshire are the George Robert Stibitz Papers, a former employee of the Bell Telephone Laboratories and important scientist worked on the development of computers, which contain some material relating to the Sperry Rand vs. Bell Telephone case. In addition to this primary source material Nancy Stern’s From ENIAC to UNIVAC: An Appraisal of the Eckert-Mauchly Computers (Bedford, Massachusetts: Digital Press, 1981) has a good summary of the history of the ENIAC and Eckert’s and Mauchly’s electronic computers and of the key issues that arose in the Honeywell vs. Sperry Rand case. Eckert-Mauchly Computer Corporation (Philadelphia, Pa.). U.S. Army Ballistic Research Laboratory. Honeywell, Inc. vs. Sperry Rand Corp., et al. Sperry Rand Corp., et al. vs. Bell Telephone Laboratories, Inc.